A SharePoint hub site links together sites based on a project, department, division, region, etc. 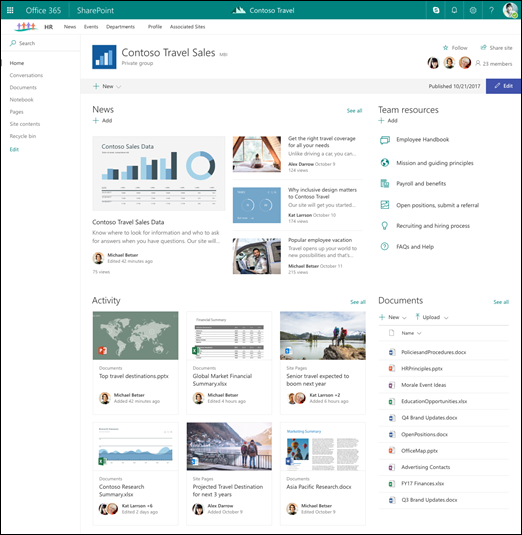 Associating a SharePoint site with a hub site makes it easier for users to discover related content, news, and site activity across all associated sites. Important: Users will only see content, news, and site activity for which they have permissions. If you are the SharePoint site collection administrator, you can associate an existing site with a SharePoint hub site. When you associate your site with a SharePoint hub site, it will inherit the look (theme) of the hub site, the hub site navigation bar will appear at the top of your site, and more features or settings may be added such as additional navigation links, applications, or custom lists with specific columns. Note: You can also associate a SharePoint site with a hub site at the time you create it by going to the hub site and clicking Create site in the top right corner of the hub site. Note: You will not be able to edit the look of your site once you've associated it with a SharePoint hub site. You must be the site collection admin to perform these steps. In the Edit site information panel, under Hub site association, select the hub site with which you want to associate your site and then click Save. You can only choose one hub site with which to associate your site. Once associated, the look of your site will change to match that of the hub site and the hub site navigation bar will appear at the top. Note: If the Hub site association option is not present or no sites are listed there, hub sites may not be enabled or you may not have permission to associate sites with a hub site. Contact your administrator for more information.